Taco Bell's Doritos Locos Taco. You've probably already forgotten how awful this year's NBA Finals were and realized how sad it is that free agency for LeBron James was always more exciting than that matchup. But there is one redeeming outcome from that 4-0 sweep Golden State put on the Cavaliers. 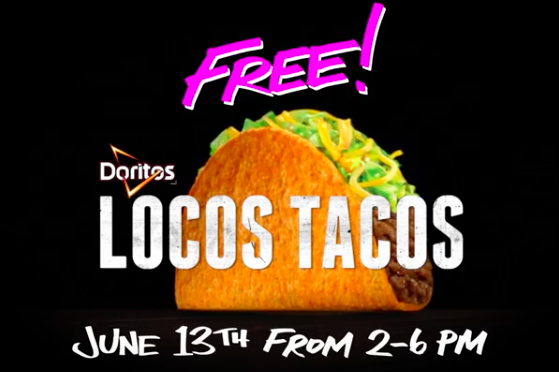 Today — Wednesday, June 13 — everyone in the United States can go to their local Taco Bell and get a free Doritos Locos Taco between 2 p.m. and 6 p.m.
Taco Bell launched their "Steal a Game, Steal a Taco" deal in 2016, when the NBA Finals featured a tough matchup between — oh wait, the Cavs and Warriors again. The deal is simple: if the road team wins game one, two or three, then fans across the country get a free taco on a designated date. This would have been much more exciting if J.R. Smith hadn't blown Game One for the Cavaliers in Oakland. Instead, the deal kicked in because Golden State beat the Cavaliers in Cleveland. Let's be real. These Doritos Locos Tacos debuted in 2012 and many of us out there who have not given them a try know deep down we want one. Tonight is the night. It's free food. And if LeBron spurns Philly in free agency, we can all take comfort in the tacos his losing won us, rather than the Warriors winning them for us.